Rishabh is a first-year medical student at Virginia Commonwealth University, hoping to go into cardiology. “I am blessed to have had the opportunity to work with FFC,” he said. “The essay on compassion and the research I had to do while reading and appreciating scripture is something that has stuck with me and I have pursued it further in college, as well,” he said. “After the project with Haiti, I decided to get involved with projects in Hurricane Katrina relief in New Orleans and floods in India. I partnered with an organization in New Orleans that helped rebuild destroyed homes in the poorest neighborhoods in the city and went with a team of college students over spring breaks to help the cause. I have been going every spring break since I came to college and the results have been amazing! Rishabh started the Health for Haiti campaign and sold blue and red wristbands to raise $1,100 in response to the January 2010 earthquake and resulting life-threatening health issues. Rishabh was able to sell the bands at 4 area schools with the assistance of other interested students. The money raised from the sale of the wristbands went to the building of a new health clinic in Camp Coq, Haiti and renovating a school. Rishabh and other students organized an “International Food Night and Glenelg’s Got Talent” event with donated cuisine and raised over $2,000. 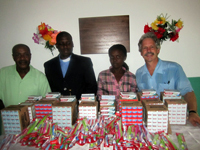 Through the partnership with the Build Haiti Foundation and his school, the Camp Coq health clinic opened in May 2011. Rishabh Khatri is currently is a sophomore at Glenelg Country School in Ellicott City, Maryland. Rishabh plays soccer and tennis, and enjoys learning about other cultures and community service. Rishabh believes that community service is a great channel for him to increase his knowledge about the world. He is fluent in Hindi and Punjabi and active in the Indian community. He is treasurer of the Common Ground Club which actively advocates for cultural and ethnic diversity. In his attempt to make the world a better place, Rishabh has partnered with the Build Haiti Foundation to help provide the Haitian children with an education by building a state of the art school in Haiti, so the children can finally have the resource of learning. In the future, Rishabh would like to become a physician because he thinks it the noblest profession: seeing no barriers and providing care to the people of any race, color, ethnicity, or gender. He hopes that in the future, after I attaining the necessary skills, he will be able to actively and efficiently make the world a better place. The future of Haiti depends on its children; without a healthy population, Haiti will remain under the dust. As members of humanity and the world; it is the duty of a human, especially one who has been blessed with a good life, to help another in need, showing compassion. In affiliation with the Build Haiti Foundation, which is building a school, a health clinic will also be built, allowing children to finally have the resource of good health. The construction of a health clinic will not only treat people, but keep them from spreading illnesses in the general population. I plan on supporting a medical facility where a physician and a psychiatrist will identify and treat children who are victims of mental trauma and physical illness. A health clinic will also provide adults with jobs as nurses and aids, allowing them to earn money through helping others. Even before the earthquake, Haiti was victim to HIV/AIDS, malaria, and typhoid; after the earthquake Haiti is plagued with innumerous cases of mental illnesses such as Post Traumatic Stress Disorder. The creation of a health clinic will not only serve to cure Haitians of mental illness, but also to educate them about staying healthy by opening dialogues between students and teachers. Education cultivates people into mature individuals, individuals capable of planning for their future and taking conscientious decisions. Education is important because it is the backbone for the healthy growth of a society, something Haiti yearns for. A new health clinic will provide testament to Haiti’s national motto, “Unity Creates Strength”, reviving a stronger Haiti through well-being for all.